On May 11th I already presented some impressions of a walk in the little village Sint Antelinks. It is the smallest borough of Herzele, located in East Flanders, with some of 600 inhabitants and a total surface of only 346 ha, which makes thus for a staggering population density of 1.7 inhabitants per ha, or 173 per km2. 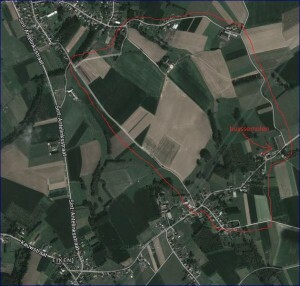 Herzele counts some 17.000 inhabitants on 4.740 ha (358 inhabitants per km2). 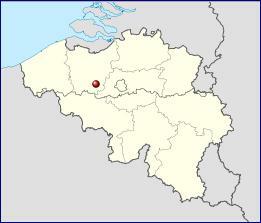 As a bench mark: Belgium has a population density of some 333 inhabitants per km2. Sint Antelinks is still a highly rural village bathing in green and with fields filled with sheep, cows and horses. Its first historic traces go back to 966. It is at the border of what is called the “Flemish Ardennes”, a hilly region varying in height between 88 and 145 meters comprising the district of Oudenaarde and the cities of Zottegem and Grammont. The highest point in Sint Antelinks is 82 meters, and on a clear day one can spot the Old Mountain of Grammont, very well known to each and every cyclist. The name “Flemish Ardennes” (Vlaamse Ardennen) was given by Louis Omer Wattez (1857-1935), not only a writer and a firm Flamingant, but also a strong defender of finding a balance between man and nature. An early ecologist. Outside the village center stands a wooden windmill of which the roots date from 1427. In 1976 the windmill or Buyses molen (Buyssemolen) (named after the last miller family) collapsed despite its protected status since 1944. Restoration plans were drawn up shortly after the collapse and in 2005 new plans were made ​​to reconstruct it. With a special transport, the mill was transferred from West Flanders to Sint Antelinks to be solemnly inaugurated on August 15th 2009. Whilst our previous walk of May 11th was located in the surroundings of the “Duivenbos” (wood of pigeons), we now headed more to the North East, direction of Woubrechtegem, turning then to the East to go back to the Mutsaard via the Hellestreet to the Kamstraat where the Buyssemolen is located. Enjoy the walk with us (click on the map to start the slideshow). More images of Sint Antelinks and Herzele can be found on the splendid website http://www.herzeleinbeeld.be/fotogalerij.html (Willy De Meerleer / Peter De Jaeger).